Have you visited the Spiral Jetty? Robert Smithson's Spiral Jetty, the famous work of land art on a remote shore of the Great Salt Lake in Utah, was completed in 1970. A few short years later, the artwork was inundated with a rising lake level and stayed mostly submerged for thirty years. As Utah heads into a drought, the lake level has dropped to a historically low level, exposing the famous Jetty. 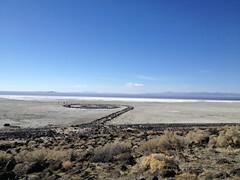 Have you been to see the Spiral Jetty in recent years? Have you been out to the Great Salt Lake only to find that the Jetty was underwater? What else did you see when you were out there? Please share your experience with Utah Public Radio as it puts together stories for its monthly program about water, The Source. The Source: Get to Know the Great Salt Lake Part 3: The Jetty's Out! A reporter at Utah Public Radio used six PIN sources as part of her social media campaign for her story about the Spiral Jetty, an outdoor work of art found on the shores of the Great Salt Lake. The reporter also read responses from one of these sources on air during the UPR program The Source, and set up a Spiral Jetty story booth as part of a project to enter sources into PIN.